When I initially planned my Euro trip, I only planned on hitting Switzerland & Germany. Luckily, I heard about some mountain called Mont-Blanc and a cool glass box you could stand in that looked like you were hovering thousands of feet above a snow-covered mountain. I mean, if I am going to travel all the way Europe, I might as well get some cool pictures. 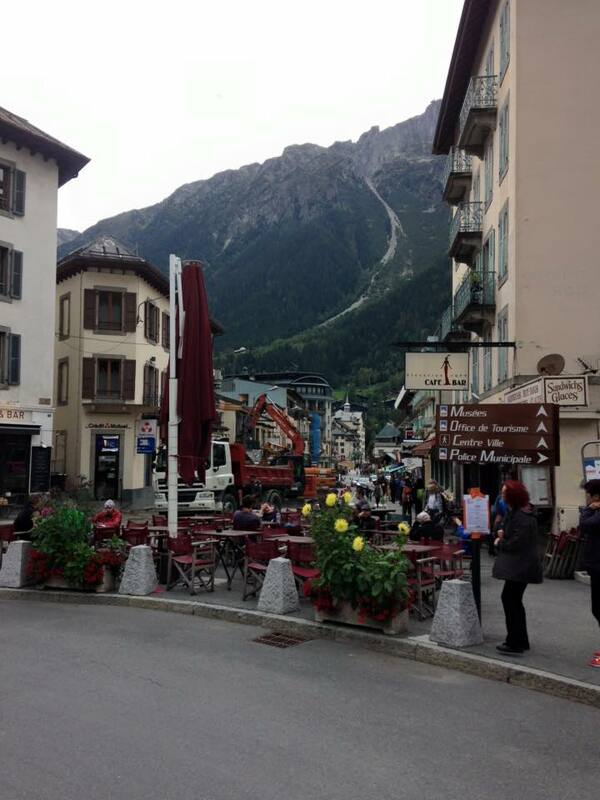 Out of all of the places I traveled, I loved Chamonix almost as much as my time in Switzerland. The mountains were gorgeous, and the town was so little and perfect. 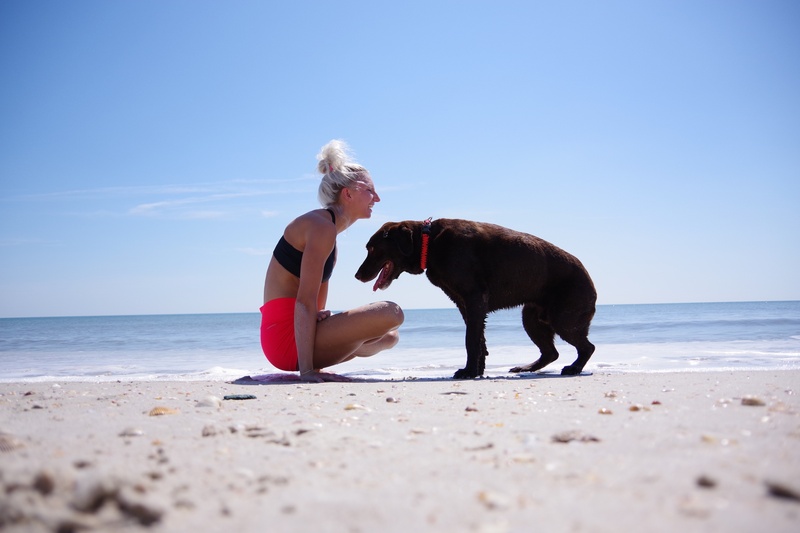 Below is a recap of where I went and what I did! 8:30 am: Departed Bus Station in Geneva, Switzerland to Chamonix Mont-Blanc (a (ski) resort area near the junction of France, Switzerland and Italy), located at the base of Mont-Blanc. 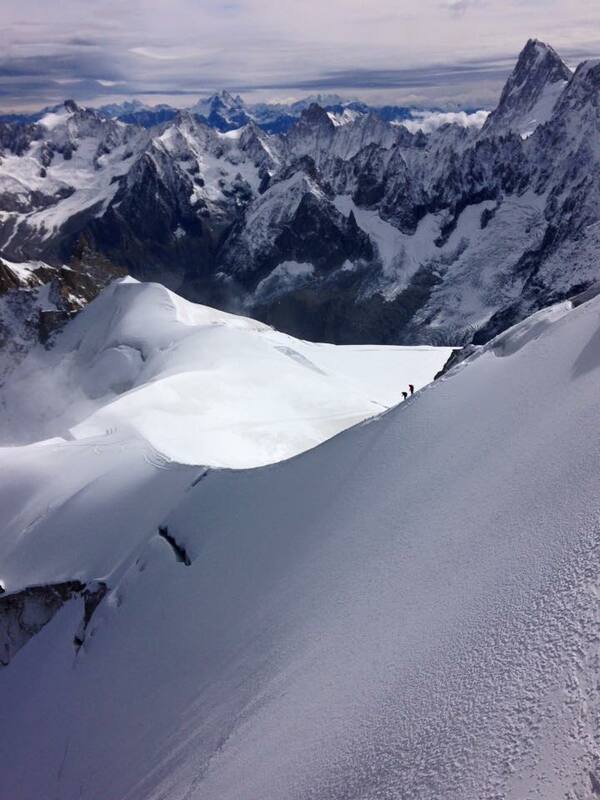 Why Mont-Blanc? Because it is the highest summit in the Swiss Alps, that’s why. So something happened on the ride to Chamonix that is going to seem pretty craz y – I met not one, not 2, but THREE people from Ohio, who all happened to be staying in Geneva and bought the same exact tour package to Chamonix on this exact same day. Completely unbelievable, but absolutely amazing. I ended up meeting up with them (1 couple on their honeymoon + another traveling for work) in Munich for Oktoberfest the week after and had an absolute BLAST. 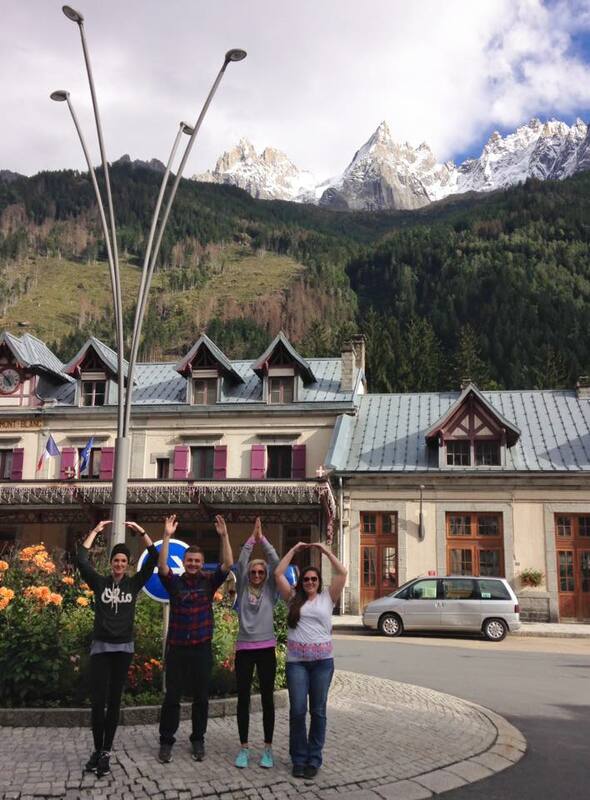 Below is a picture of us in front of the Alps doing the O-H-I-O sign – one of my favorite pics from the entire trip! 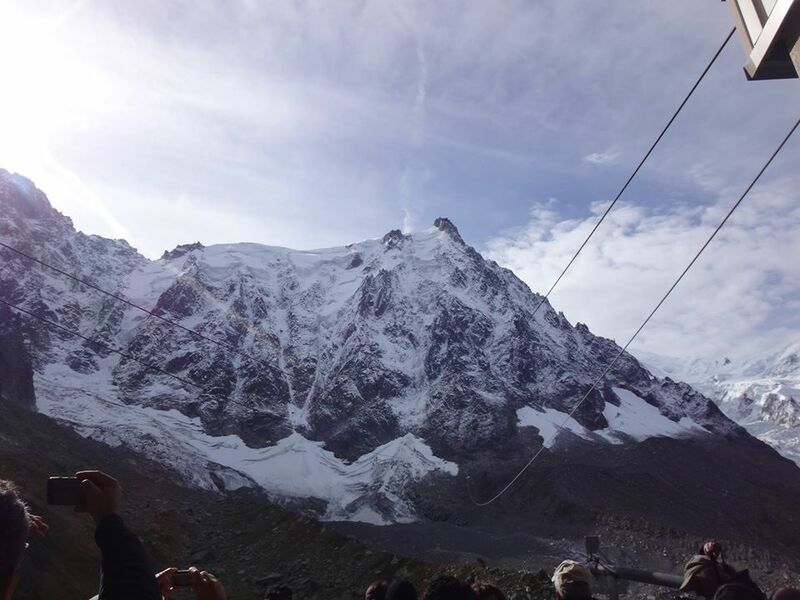 Anyways, upon arrival, we all split ways and made our way up Aiguille du Midi – it is a 3,777 meter tall mountain next to Mont-Blanc, and it took 2 cable cars + 1 elevator ride to get all the way to the top. and it.was.FREEZING. Luckily I was smart enough to wear 2 long sleeved shirts + a sweatshirt, a scarf, and fleece leggings… even still, I could not feel my body for about half the day. But the view… the VIEW. 100% worth everything. 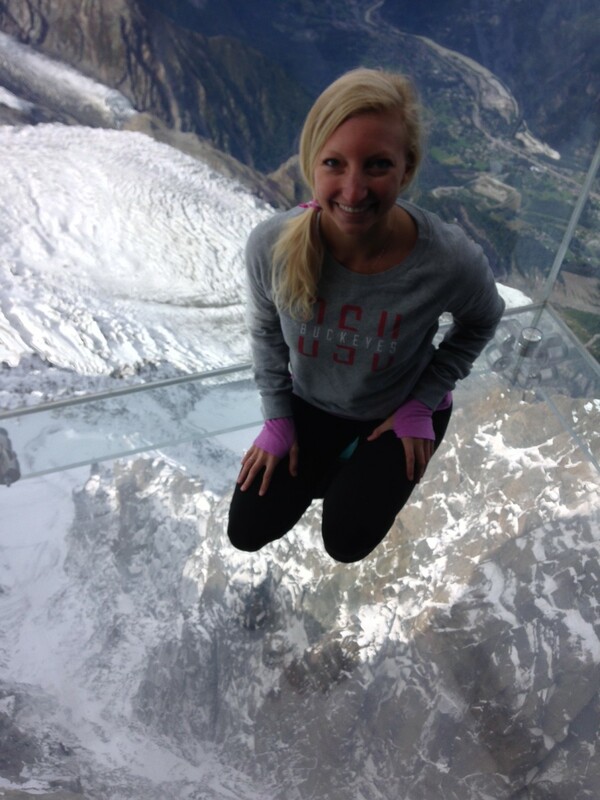 Why is Aiguille du Midi the mountain to go up? Because the terraces on top have a 360° view of all the French, Swiss and Italian Alps, and a lift brings you to the summit terrace at 3,842m, where you will have a clear view of Mont Blanc (source). Also, this is where that cool glass box thing was, and I could not NOT go. I waited almost an hour to take the elevator to the top… and it was worth it. I mean, just LOOK at the view!! Also – there were several people coming up and down the mountain – you can see them as small dots in the picture below – total Respect for these hikers! 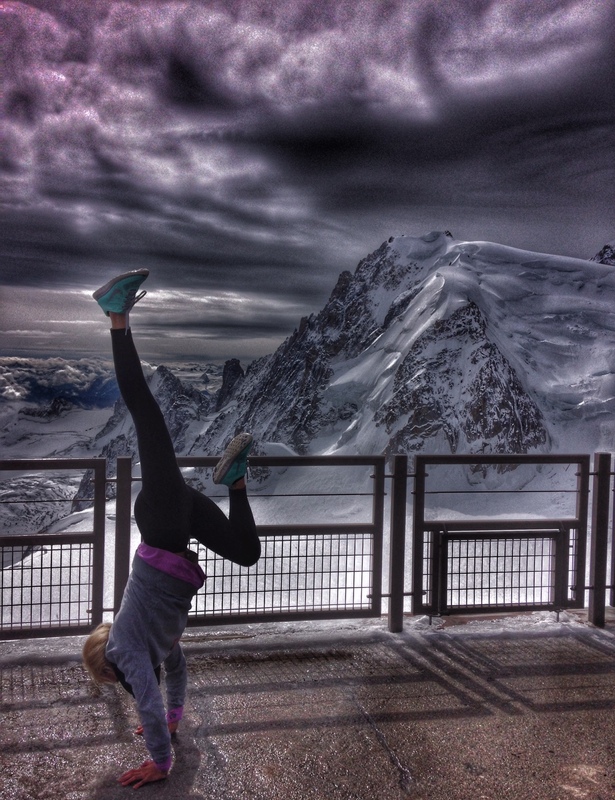 Handstands were necessary, although it was super icy, cold, and hard to breathe that high up. but I managed! 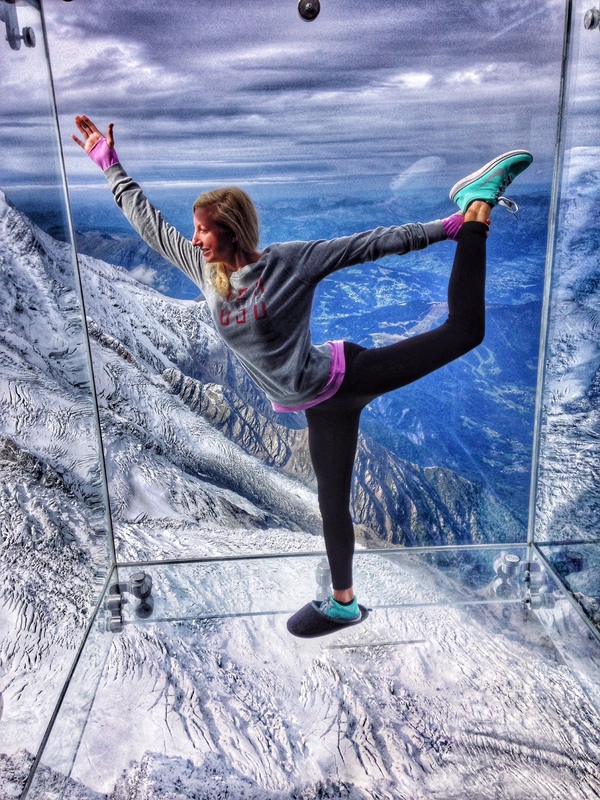 And now for the glass box… It is called “Step into the Void” – a big glass box that hovers over the mountains, making anyone that steps into it look like they are floating 3,800 meters high over the mountain. Since the box is made of glass, you had to put special slippers on, and a very helpful employee would take your pictures. 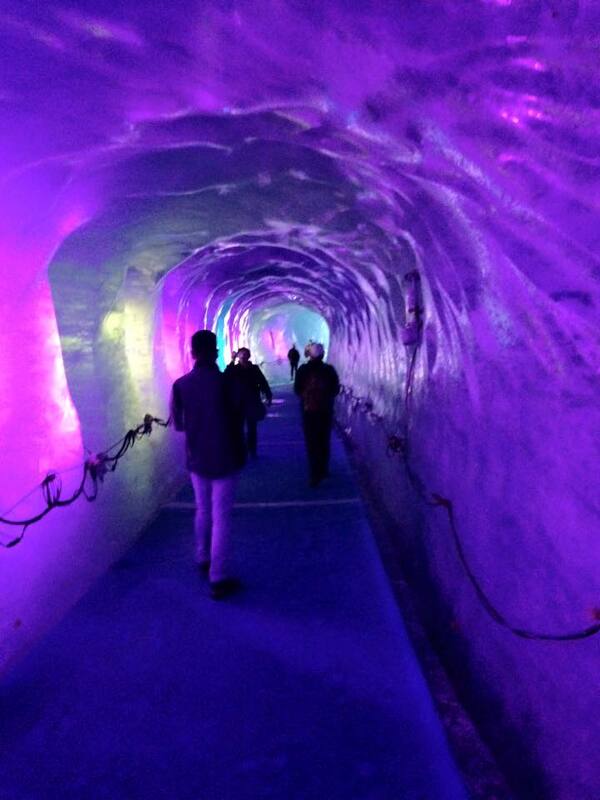 After all of the excitement, I could barely move I was so frozen and was feeling a bit dizzy from the altitude. 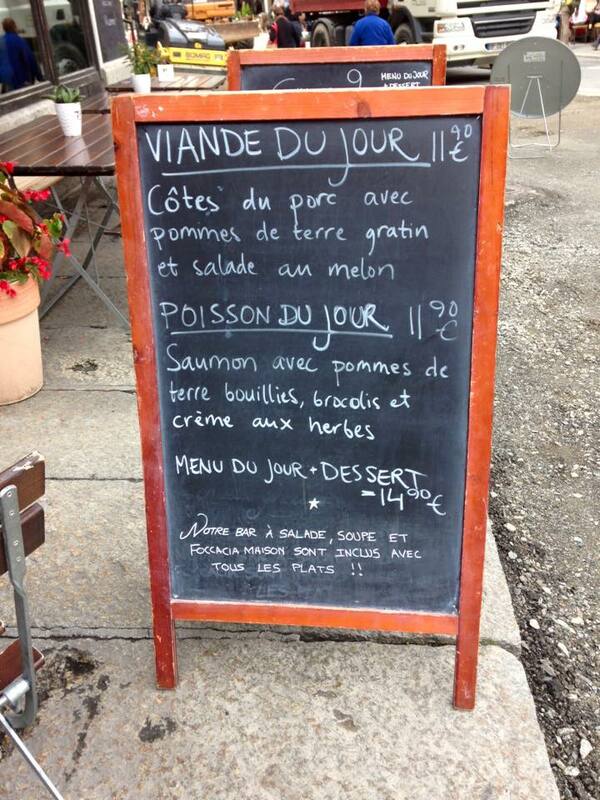 So, down the mountain and off to meet back up with the group for lunch at Hotel Gustavia – and it was amazing. 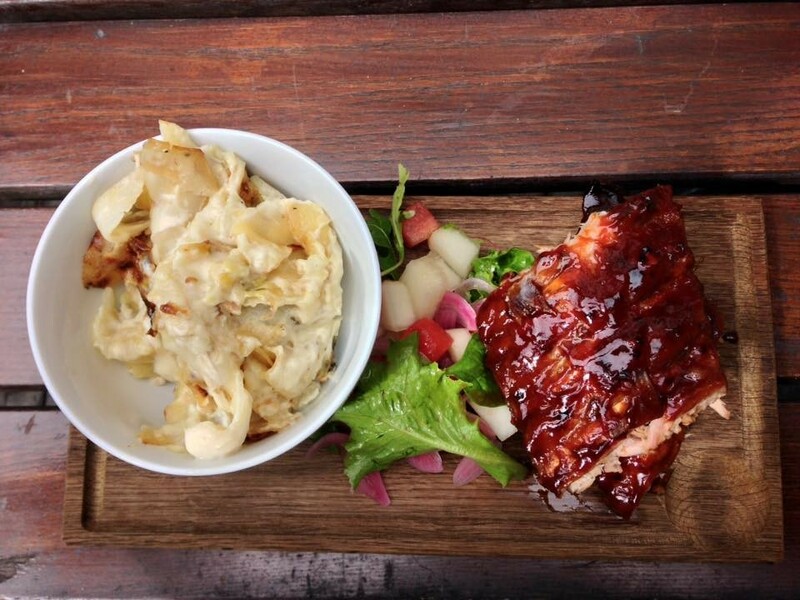 A warm Beet Root soup & salad with ribs, au-gratin potatoes, and a fresh salad. Absolutely amazing! 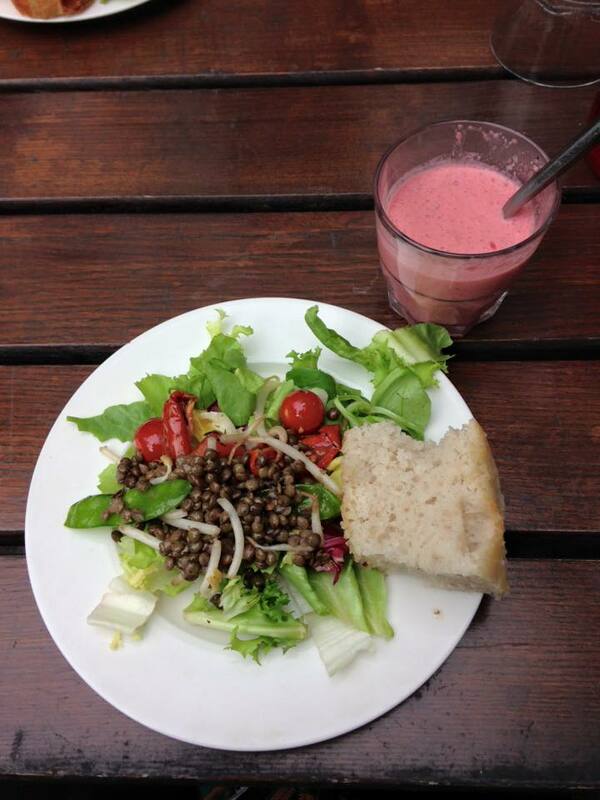 I really, really do not like beets, but I have already bought ingredients to try and re-create this soup.. Europe has forever changed my taste buds! 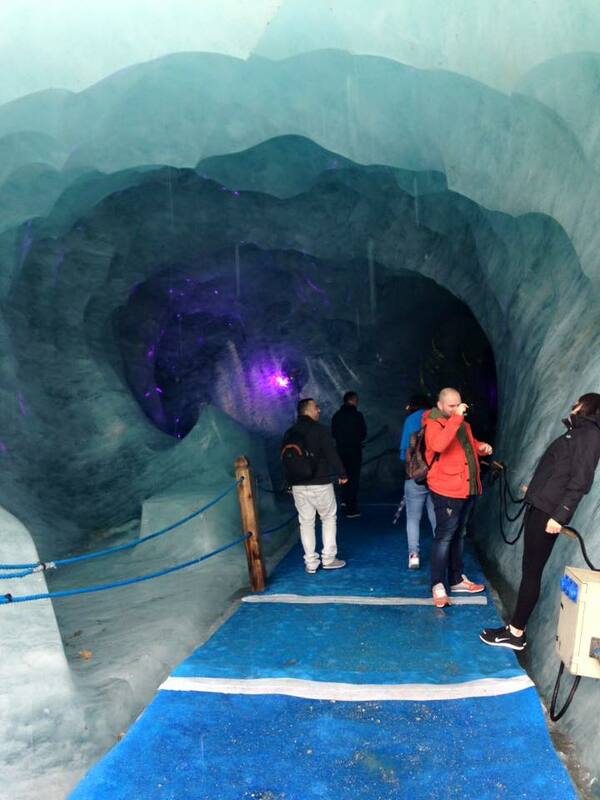 After lunch, the group took a trolley to Montenvers – Mer de Glace to see the “Grotte de glace” (Ice Cave). 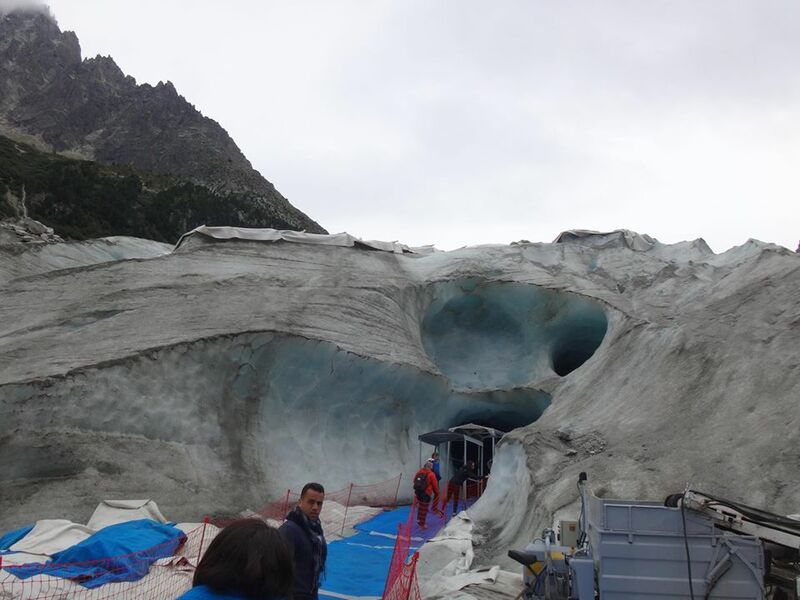 A quick description from the website: The tour of the “Grotte de glace” (Ice Cave) takes visitors into the very heart of the glacier. Re-sculpted every year, it describes the life of mountain people in the early 19th century. I took a gondola lift down, then another 400 steps down to the caves. Yes, it took a while to get there, but it was worth it. I basically sprinted down the steps in order to explore and get back to the trolley on time. 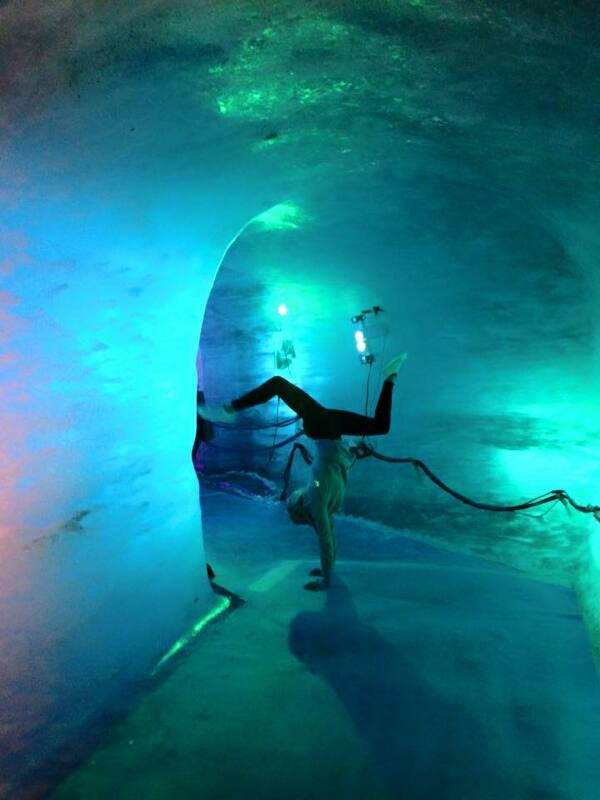 I was expecting a huge maze in the glacier, but when I finally got inside, it was just a small loop that took about 1 minute to see. However, it was amazing. 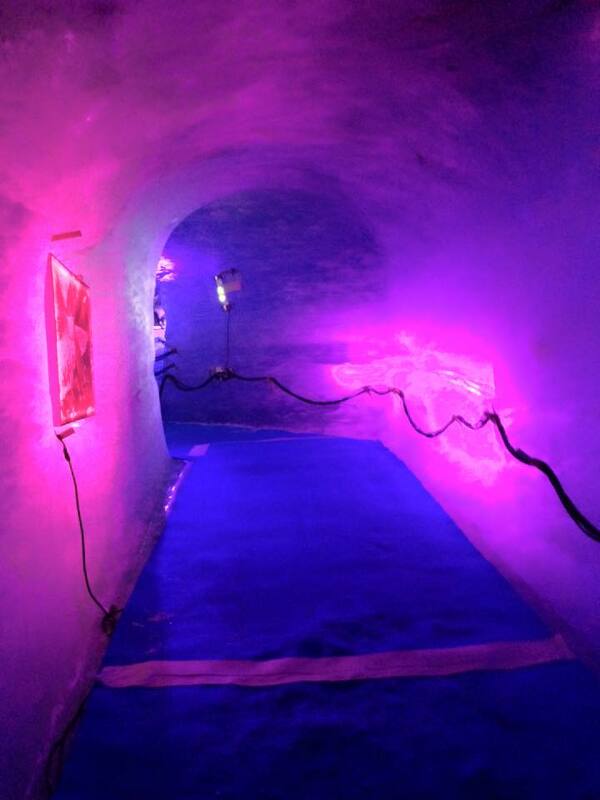 There were lights in the glacier that turned colors, which made everything look that much cooler. Pictures can’t even begin to describe how awesome it was! After exploring the cave, I tried to run up the 400+ steps back up… tried. 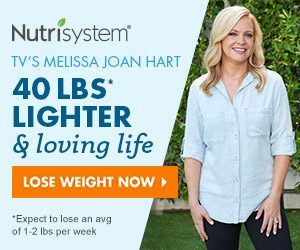 More like running up stairs, then stopping to rest at every level. 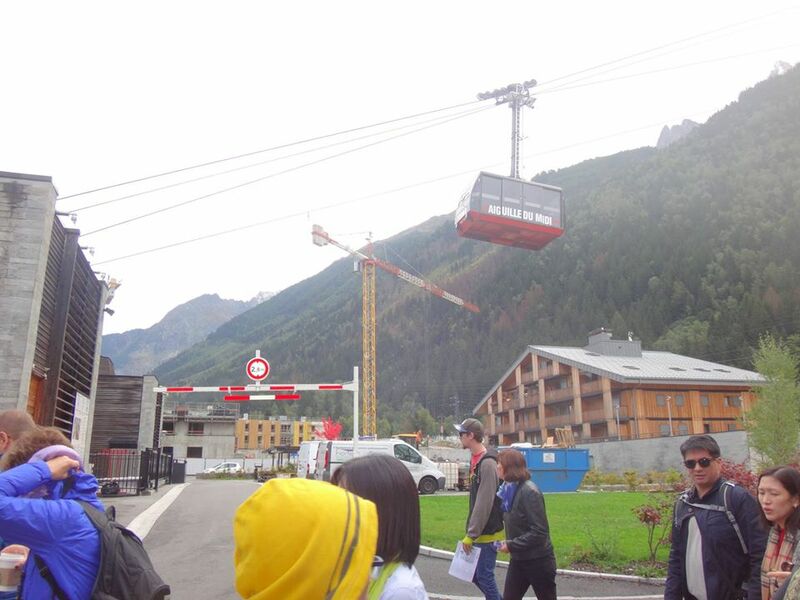 But, I made it back in time for the trolley to take everyone back to Chamonix. I ended up walking around the town a little bit & taking pictures – I still cannot get over how cute this place was. There was an older couple that had spent a week there and were making their way through France, hiking and visiting wineries. Basically, life goals. Amazing and romantic place to visit – I will be back! I added on to my bucket list to come back and run the 23km race someday… I loved the area THAT much!! After arriving back at my Air Bnb, my hosts cooked me an authentic Italian meal of spaghetti. The absolute perfect way to end the day! And BTW – if anyone is visiting the area, I highly recommend taking a tour through Viator – no, I am not getting paid to promote this. I just had such a wonderful experience, and the guide, Neil, was absolutely hilarious. So don’t think buying pre-planned tours is touristy – it takes the stress out of planning every single day of your trip, and you end up meeting some really, really, awesome people who are also traveling! 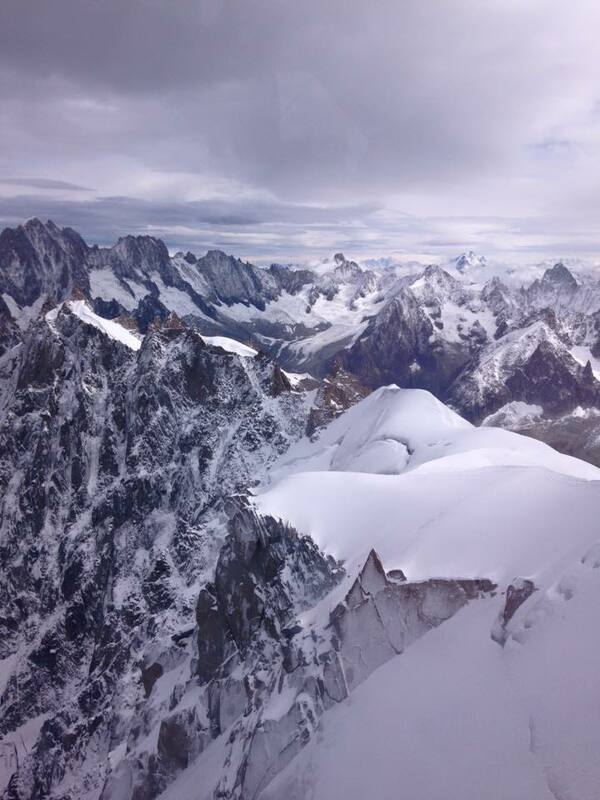 Breathtaking mountains in Chamonix. 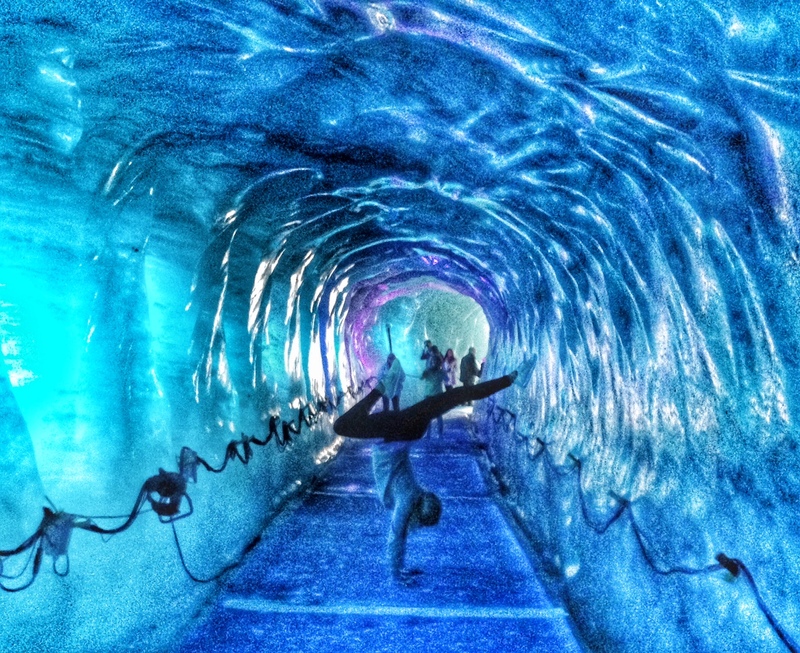 I didn’t realize the ice cave was in a glacier. How cool. Great description!